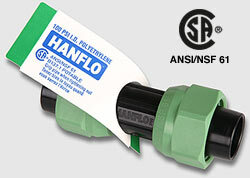 The HANFLO fittings are certified by CSA to CSA standard B 137.1 when used with PE 1404 CSA 75 PSI and CSA 100 PSI polyethylene pipe. They have also been approved by CSA for potable water under ANSI/NSF 61. The fittings have been tested for long term pressure tests (1000 hours at 1.5 times the pipe pressure rating) and pipe pull out tests to International Standard Organisation (ISO) requirements.